Welcome to the March 8th, 9th edition of Photo Art Friday! If you have been creating art from your photographs and would like to showcase it in our little virtual gallery ... come on in! You can read the guidelines for participation here. Any piece of photo ART is welcome or you can share a piece that conforms to our weekly theme or challenge. 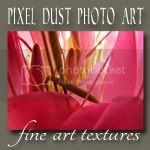 This week's optional challenge is to create a piece of photo art using Pixel Dust Photo Art (pdpa) textureS and one of your own images. 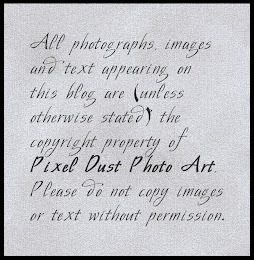 Hope you experimented with this challenge and discovered that using textures (especially pdpa textures! - OKAY, I admit it - I'm a tad biased!) 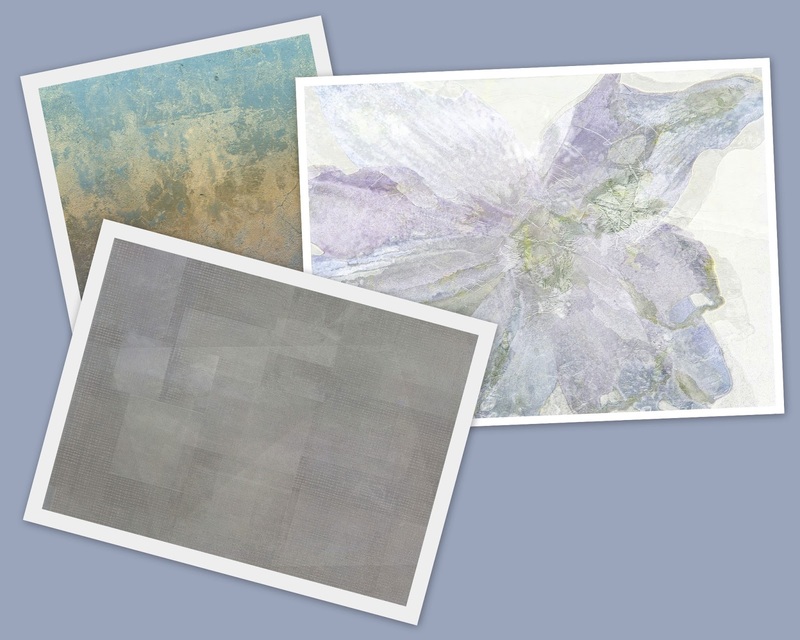 is a great way to create abstract art pieces you can actually hang in your home or give as gifts to ones you love. Click on image to enjoy a larger view. Here you see the six components I pulled into my project bin with which I hoped to create a piece of photo art. In the end, the bottom right image was not used. 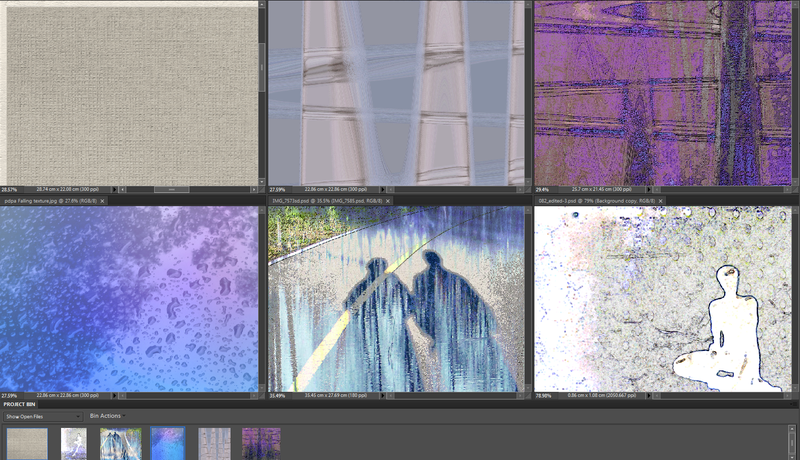 In the layers panel, you can see steps used. 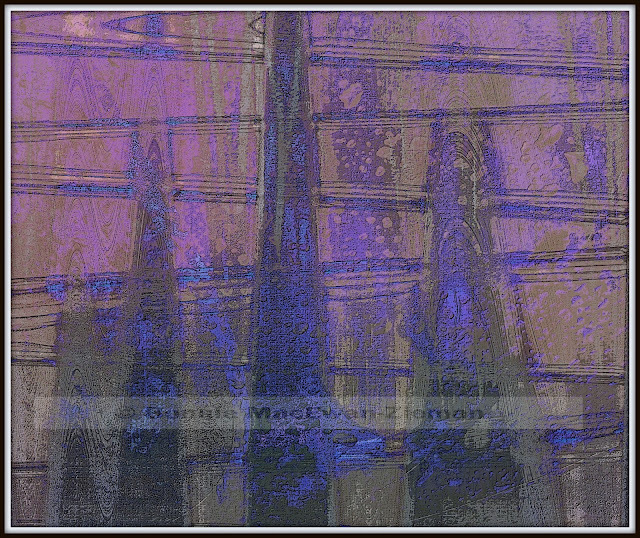 Because of where I placed the large abstract image in this screen shot, you cannot see that the eye (on/off button for layer) on the sitting figure was turned off and thus does not appear in the piece. The final version was also rotated 180 degrees. I broke one of my own rules while making this piece. I did not save as I edited. I had a beautiful blue abstract image before I added the last texture and processed it in Difference. But I got excited when I saw the image processed in Difference and continued on - totally forgetting that I had just lost a great image by not saving as I processed. I tried to take my final PSD (which has most of the layers) and undo and undo to get back to the lost image, but it did not work - probably because I had flattened the image before processing it in Rad Lab. And so ... I had to learn the lesson again, the hard way ... SAVE AS YOU GO! Twenty minutes later: here's what I was able to do. Actually, it is not exactly the same as what I remembered (quelle surprise! ), but I really like it. Lesson: Even if you can't reproduce it, you may create something you love - so it's worth a try! The shadows are those of my DH and myself. 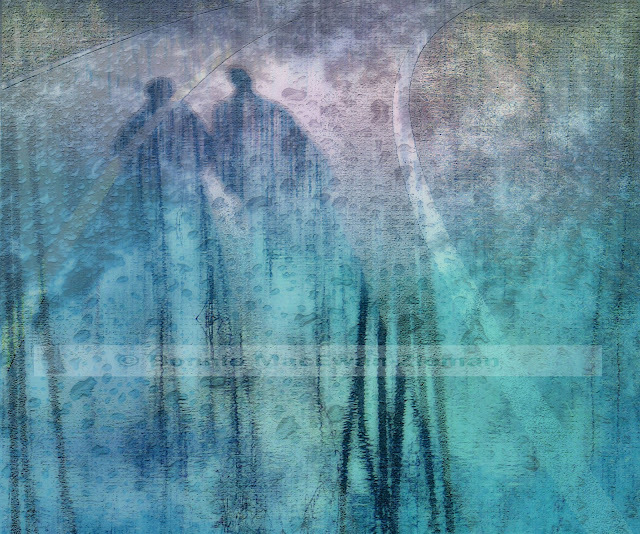 Only the background texture and the raindrops texture were used with the image of our shadows in this piece. RadLab's stylet "Rusty Cage" reduced to 70% opacity gives the image the sweet, soft blurry look. 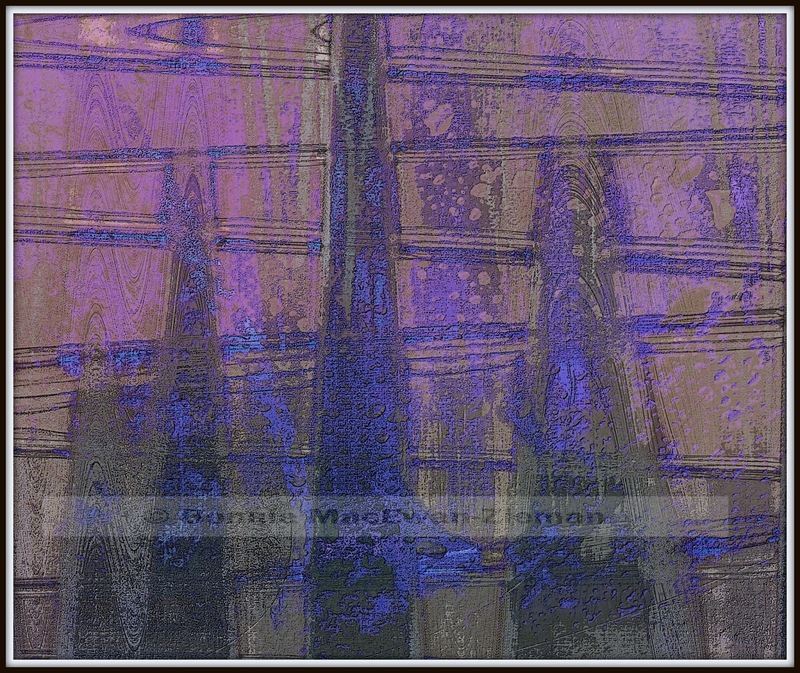 Another piece of abstract photo art using pdpa textures and one of my images. These are the three elements I used to make the above abstract. 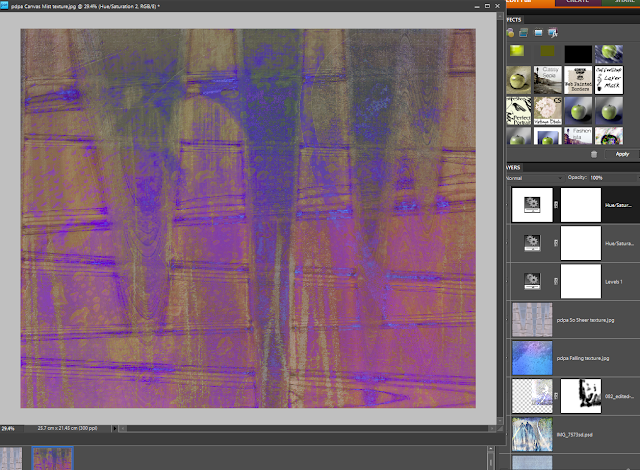 * Opened pdpa PAF Gift texture to serve as the base for this abstract. 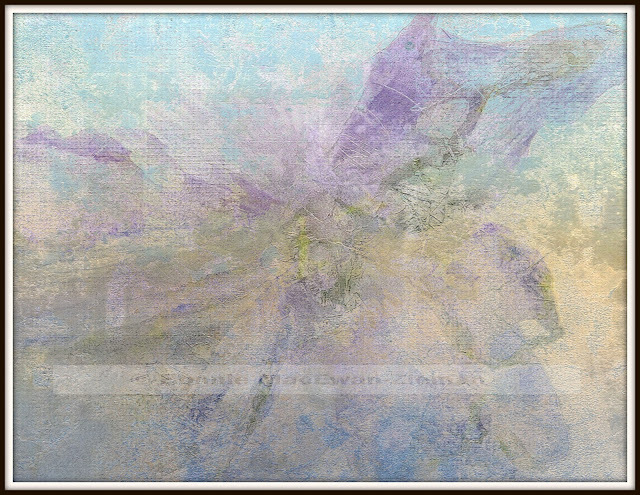 * Superimposed a piece of photo art that was originally a macro of a delphinium blossom, and processed that piece on PAF Gift in Multiply Blend Mode, Opacity 65%. * Duplicated that layer and blended it in Difference at 85% (I rarely go below 85% opacity when using Difference - you usually lose all the 'difference' by going lower!). * Because Difference Blend Mode produced a dark effect, I added a Levels Adjustment and adjusted the grey and white tabs to bring in light. * With the addition of light a bit of the color was lost, so increased the saturation with a Saturation Adjustment. * Ran the image through RadLab using stylets "Lights On"; "Oh Snap"; "Iron Mouse"; "Prettyizer". 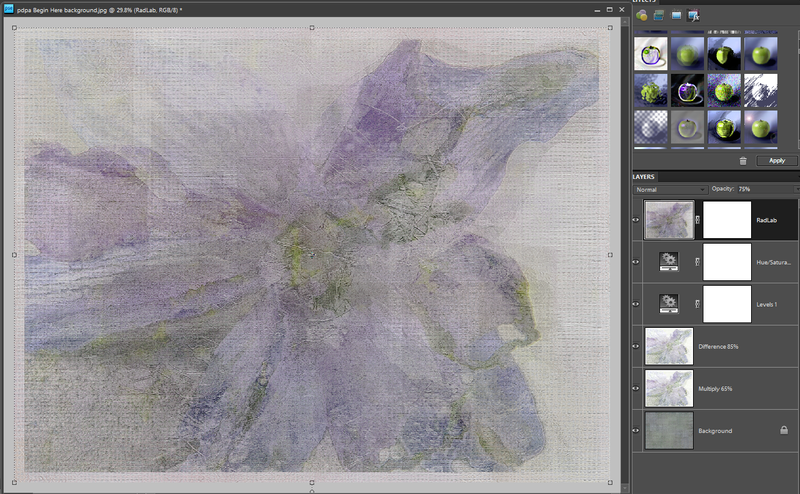 Reduced the opacity of the RadLab treatment to 87%, once back in Photoshop. 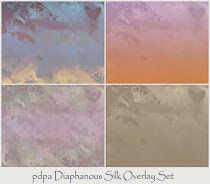 Still found this abstract needed something more, so added my pdpa texture "Marble Sky". Blending it in Darker Color at 70% Opacity. Then added another Saturation bump up, and more light with a Levels Adjustment. Added my copyright banner and was done. Give your imagination free reign. Consider stretching the interpretation of the word "portrait" beyond its traditional definition. Of course, you may decide that traditional portrayal is the way you want to go. Just remember that themes do not have to strictly dictate everything about the style, subject matter, presentation or possibilities. You always have the option to step out of the box ... or not ... as YOU wish. And ... there are always degrees of 'stepping'. Maybe you want to start with a baby step ... or perhaps you are itching to take a giant leap. Either way, I can't wait to see your 'portraits' - next week for the March 15th - 16th edition! Powerful pieces, Bonnie. I decided from the get-go NOT to even try recording steps, which of course I kind of "know" without recording, yet since I am using Picasa and Pixlr, I don't "have" the same step-by-step of PSE8. I love how you mixed and blended textures and your photo. I'd thought to mix 2 or 3 of the textures I did, but realised straightaway that each one stood better on its own. This was a great challenge, as in a so-fun-I-would-love-to-DO-it-again!! I have been lost in this for several hours and it's been splendid!! Really looking forward to seeing what everyone has come up with. Again, WOW!! your colours and processing are amazing!!! I am inspired by your stunning examples! WONDERFUL work.WONDERFUL play. Again thank you for all the inspiration! And thanks for doing it! It *is* very interesting - and educational - to see how others go about creating the effects they want, and I love trying out new techniques! Your work is absolutely breathtaking... Such delicate balance between light, shapes and hues... I sit mesmerized! Bonnie, your processing is fantastic, as always...I especially love the last two because they're filled with my favorite colors of blue, green, and purple! Amazing art work. Thank you for sharing! as always, I love your creations! you're such a creative soul! Beautiful pieces, Bonnie! Don't you just hate when you forget to save a piece you love! Nice that you were able to recreate (almost) the blue piece. I think that's my favourite of the ones you've posted here. i really like the abstract that you created with the inclusion of the shadows~! thank you for sharing the steps that you used as well as the free texture 'gift'. i had fun using it within my work/play this week. Loving that one of the shadows and the raindrops, and that last one is beautiful! Your work and your blog inspire me a lot! Thank you for hosting and for sharing your textures! Definitely beautiful works of art here!! This is my first time participating. Thank you for hosting. 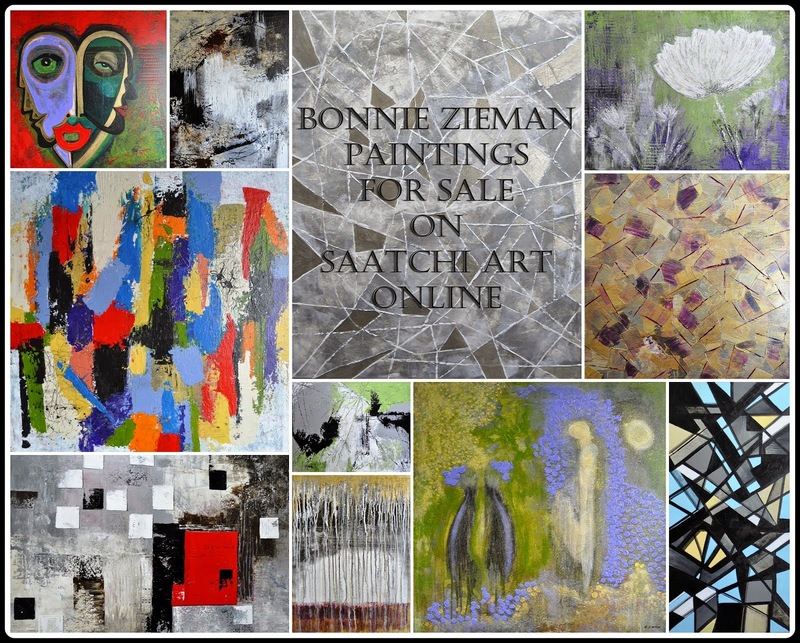 I am so impressed with your new abstracts, Bonnie! They are both stunning, especially the final image of the flower--a gorgeous, Impressionist piece. Thanks once more for making me stretch my artistic self and learn some new things. Thanks Bonnie...your pics are fabulous! Bonnie, First let me say your work is awesome. It's interesting to see the different elements you used to create your pieces. I love the floral one the most but they are all really well done. Second, thanks for this challenge. 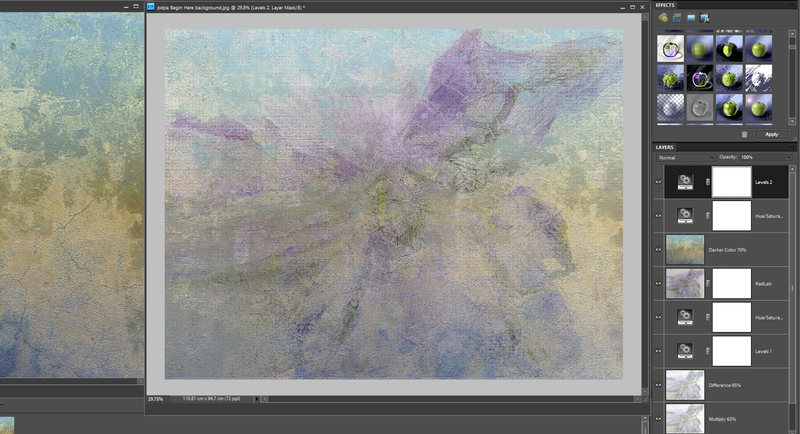 I actually decided to try and see if I could create something abstract just using your textures. I even worked in "Gimp" which is something very out of the box for me since I know so little about how to use that program. I had fun and was pleased with the results so thanks for issuing the challenge. Hello - my oh my -- great show of talent -- I really like the rain drops and the shadows -- and the colors - wow how you used the texture designs in your photos is awesome -- it's all look grand.. thanks for sharing your ideas and tips..
Oh wait - by the way this is an other first time ever to do a abstract - I am not sure if I did one but I did try it! If you have any tips for me they are welcome -- anytime!!! Love that you encourage us to create with textures. I had so much fun. Your piece with you and your hubby's shadows is my favourite. Yes, I like these interesting textures. You have presented us with some beautiful art work!!! !